Workers of teaching hospitals and research institutions have called for urgent review of the national minimum wage to them from abject poverty and avert industrial action. 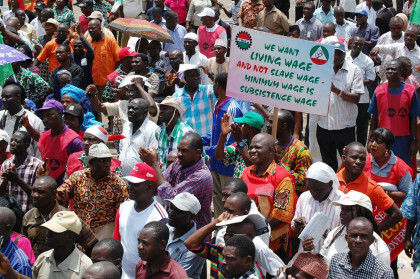 The workers, under the auspices of Senior Staff Association of Universities’ Teaching Hospitals, Research Institutes and Associated Institutions (SAUTHRIAI), made the appeal in a communique at the end of their meeting in Lagos. The communique, made available to the News Agency of Nigeria (NAN) on Monday in Zaria, Kaduna State, was signed by the association’s Sectoral Chairman and Secretary, Felix Uwadiae and Ademola Olajire, respectively. The communique said: “The council frowns at the delay in reviewing the current National Minimum Wage in the face of current economic realities. The communique lamented the imposition of additional tax leading to irregular deductions of salaries, allowances, union dues and other obligations by IPPIS which had resulted to workers’ untold hardship. It appealed to the Federal Government to look into the complaint with a view to ending the difficulties being faced by workers.